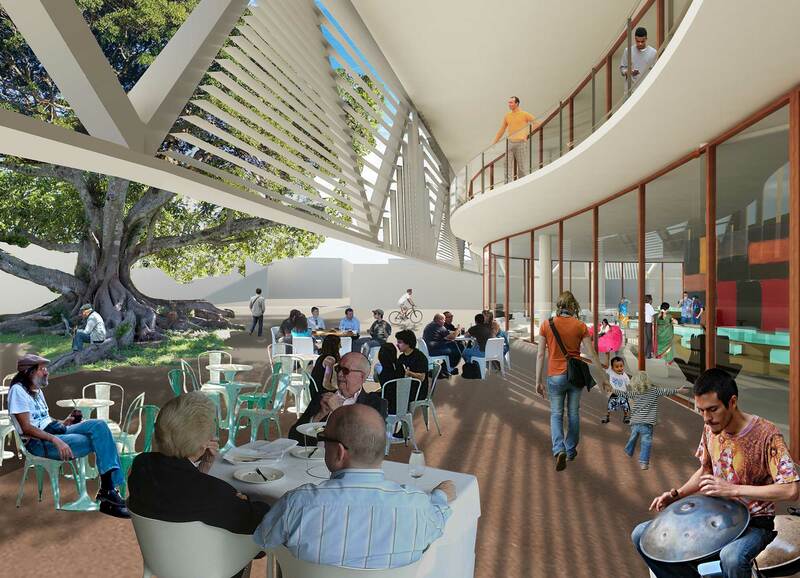 An organic shape: The new Cultural and Civic Hub for Coffs Harbour is welcoming. It is a building in a round, with no front, no back. 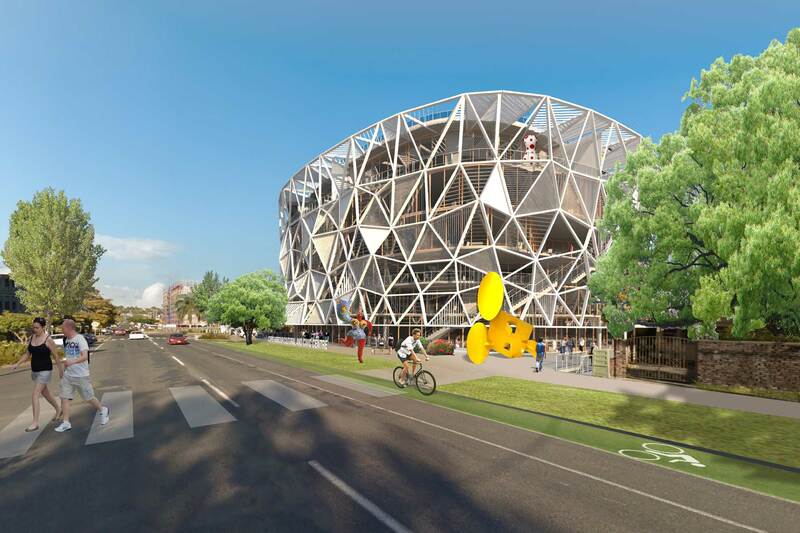 Its organic shape will attract locals and visitors alike and allow access from all directions. The geometry of the shell is inspired by Gumbaynggirr and more broadly Aboriginal art. This organic shape creates large flexible floorplates, that can be easily modified internally for future needs and uses at reasonable cost. Large floorplates are ideal for the functionality of the library, gallery as well as council offices. 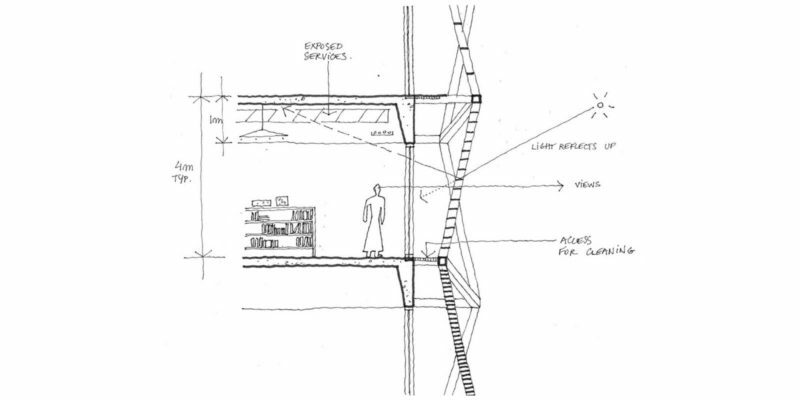 They favour social interaction by facilitating accessibility for everyone and minimize the use of lifts. Their environmental performance is also exceptional by creating a large thermal mass. The building will stay naturally cool for longer without the need of air conditioning. Night time flushing of the air will be used to cool the structure. Local identity (material): Around the perimeter, a white ‘lace’ wraps around the building. It is a tall playful white layer which draws intrigue from being humble and sophisticated at the same time. This sunshade screen is divided randomly into a multitude of triangles designed to protect the glass and timber façade from the environment while letting maximum daylight penetrating in the interior. A beacon (height): The Cultural and Civic Centre is tall. Its upper level is 28m high just above the surrounding tall buildings. These 6 storeys are crowned by a 3-storey tower creating a beacon in the CBD. It will be seen from Pacific Highway and further afield from the surrounding hills. 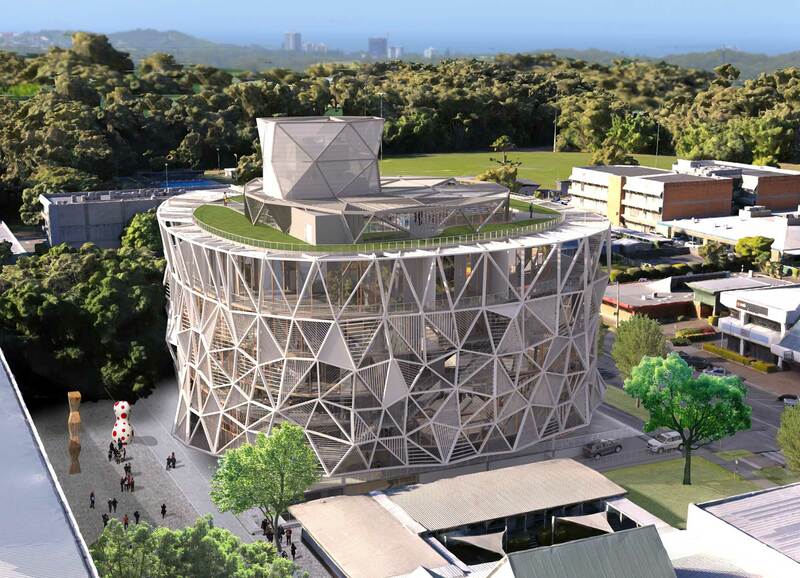 The top tower will be clad with white sails as a symbol of the city. At night the tower is lit. Projected images on the sails will create an ever-changing image of the building. It can be curated to announce public events and community programs. A welcoming and comfortable interior: To contrast with the white external skin, the interior is playing with timber and colours. The main entrances on both sides of the building are connected with a central 6 storey atrium which allows views up to roof gardens and creates an internal link from Gordon Street to Riding Lane. 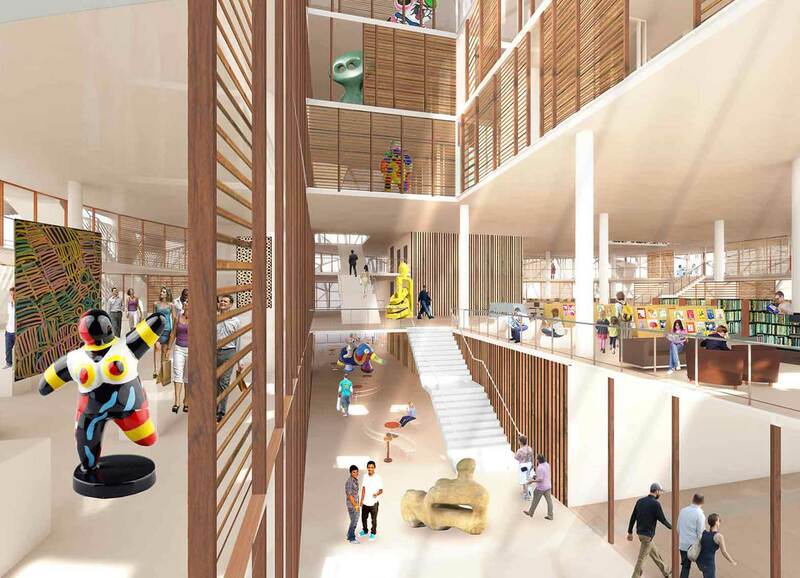 Library: The Library Occupies Ground and First floors as well as a mezzanine space at level 2 which defines the great hall of the library and offers elevated public living room areas around the perimeter. The library also has its own secure internal stair which doubles up as an amphitheatre for reading or open seminar. Local History Museum: The Museum occupies the Ground and First floor, and is visible from the Entry Lobby. The Gallery occupies Level 5, with additional gallery space adjacent to every lift lobby on every upper floor. The Council Chambers, executive offices, volunteer spaces, kitchen and sculpture gardens. Council Offices and Chambers: Council services are on ground level and are visible from the Entry Lobby. Council’s offices are located on Levels 3 and 4. Co-workers space shares Level 4 and has its own entry on that level. 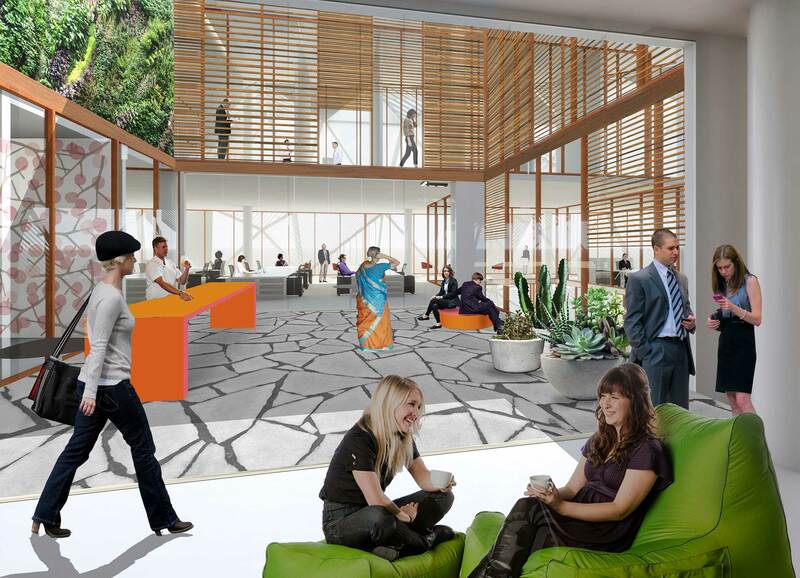 Level 4 also features the Staff Hub which include a private roof deck. The floor plates are large for better workplace functionality and future flexibility; loose fit, long life. The Council Chambers and terrace around can be used as a function space. The fixed seating of the Chambers can be isolated, allowing the rest of this large space to be used for public or private functions. Gallery: The main gallery space is located on level 4. It is a large space, opening onto a terrace that surrounds the building. 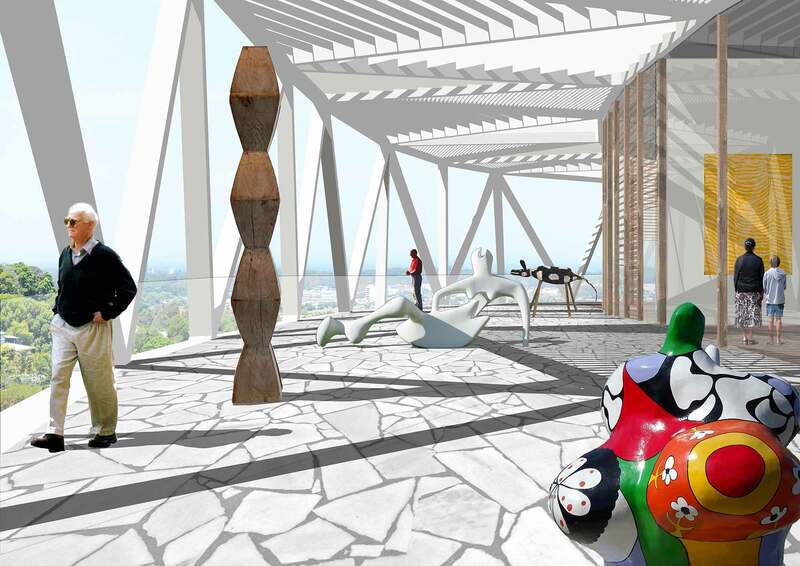 The terrace can be used as a sculpture display with district and ocean views backdrop. Additional gallery spaces are distributed over the lower floors in the atrium, inviting the public from the ground to the upper levels. Outdoor Amphitheatre and Roof Garden: Crowning the building is a roof garden suitable for public or private functions with lift access. It includes an Amphitheatre. The roof garden includes a small function room, wet areas and a large shade structure. This roof garden allows the building to be able to go beyond the usual civic functions such as outdoor cinema, weddings, seminar, receptions, and other well curated events. The views from this level are extensive. Environmental Performances: The image of the building has a welcoming civic presence and responds to the public’s expectations. 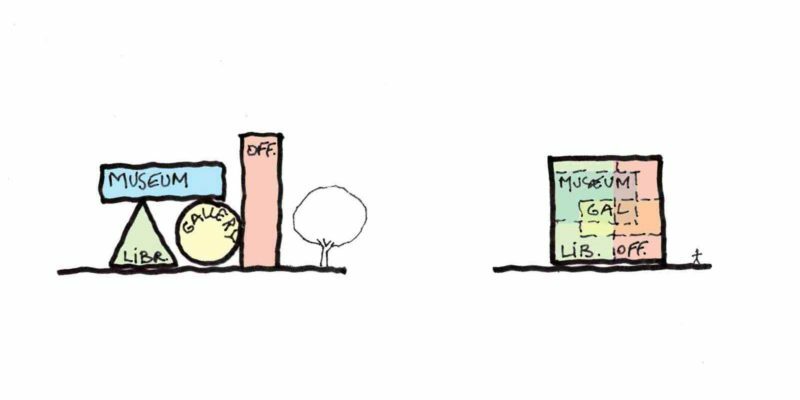 It is also an exemplary model of sustainability: Deep floor plates creating a substantial thermal mass; efficient shading of the façade; roof garden for further insulation and reducing urban heat island effect (UHI). Additional environmental actions could include: harvesting and re-using rain water, wind and solar generated power, green star rated materials, fixtures and furniture. All these measures will help the building to achieve a high green star rating.